Victoria Kincaid is back to chat about her latest novel, Darcy and Deception, and I'm happy to have her here. I have followed Victoria's writing from the beginning, and I am always eager to see what she written next. In Victoria Kincaid's first book, she took Darcy and Lizzy to France. It was a unique premise and one that I enjoyed immensely. 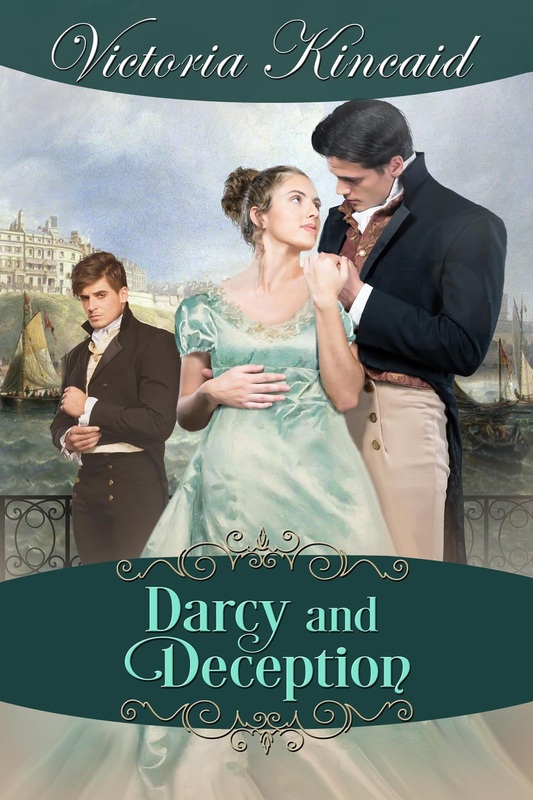 Darcy and Deception have Darcy and Lizzy in France again, but under quite different circumstances. I believe I will leave it there and turn this over to Victoria. Please join me in welcoming Victoria Kincaid. Those words had haunted Elizabeth’s dreams for a week. All of Mr. Darcy’s words from that ill-fated night circled her mind like birds that refused to land, continuously intruding upon her thoughts. But the declaration of love, in particular, pushed itself into her consciousness again and again, a most unwelcome visitor. Many of his other words that day had been painful and had provoked anger. Many she could dismiss as the result of his mistaken pride or his misapprehension of her character. But he had declared his love in an eloquent and heartfelt—and apparently unforgettable—manner. Those words could not easily be brushed aside or ignored. The shock of Mr. Darcy’s declaration had not worn off completely. At unrelated moments she would suddenly be struck with a recollection that the master of Pemberley had made her, Elizabeth Bennet, an offer of marriage. Even now as she watched the scenery of Kent stream past her carriage window, she struggled to reassure herself that the event had indeed occurred. It would be easier to comprehend the happening if she could speak with someone on the subject, but she had resolved to tell the story only to Jane. Nobody else would have the requisite discretion and understanding. If she told her father, he would be incredulous before considering it to be the occasion for a good many jokes. Her mother would be in despair that Elizabeth had refused the offer. Kitty and Lydia would perforce share the news with the entire population of Hertfordshire—which was also true of her mother, come to think of it. Mary would moralize. Only Jane will keep my confidence and will not laugh at my ignorance. Elizabeth willed the carriage to greater speed so that she might see her beloved sister all the sooner. She arranged herself more comfortably against the carriage’s squabs and imagined the solace of Jane’s presence. Her sister might also offer useful counsel. Elizabeth could use some advice. Reading Mr. Darcy’s letter had been a most unsettling experience. She had thought Mr. Darcy a villain and Mr. Wickham a victim, but the letter had revealed how wrong she had been. She had believed he disdained Jane’s match with Mr. Bingley because of her dowry when he had believed her sister to be indifferent to the man. Likewise, Elizabeth had assumed he had observed her with disapproval and disdain when he had been viewing her with…longing. Elizabeth closed her eyes briefly, still dismayed by the depth of her misapprehension. She still struggled to ascertain her own sentiments about the man. When Mr. Darcy had spoken in Hunsford, she had been horrified, but now…she knew that much of her dislike was based upon false information…. How did she feel about Mr. Darcy? Believing he held disdain for her, she had felt the same for him. But knowing he loved her…could she love him? He was handsome, well spoken, and certainly eligible. They enjoyed lively conversations, and their tastes in books and music were surprisingly harmonious. But he was proud and difficult. Was he not? If only she could see him with new eyes! More than once Elizabeth wished she could conjure him from the air so she might judge him with improved understanding. Perhaps she could have developed tender feelings for the man under other circumstances. Elizabeth shook off this thought and gazed out of the window to distract herself, spying a stream and a patch of wildflowers that had just burst into bloom. How lovely. Yes, she would think upon these sights and ignore any thoughts about Mr. Darcy. After all, her misjudgment of the man hardly signified. Their paths were not likely to cross again—at least in the near future. Perhaps in ten or fifteen years they might meet by accident when they were both married to other people. Why did that thought make her sad? Thank you for visiting, Victoria. It is always such a pleasure to have you stop by. I must say, I have been intrigued by this new story of yours. You always seem to come up with a new twist and I like that. I look forward to seeing what you "have up your sleeve" next. 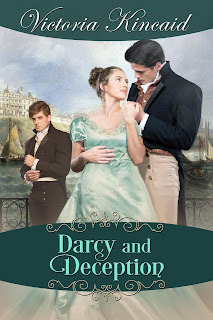 I think you have another winner with Darcy and Deception and I hope to post my review of the book in the future. I truly enjoyed reading it. Victoria is giving away one eBook to one lucky winner. Leave a comment to enter. Tell us what you think of Wickham as a spy. What do you think about Elizabeth pretending to be besotted with Wickham? What will Darcy think? Oh, my! That does pose a serious problem, doesn't it! 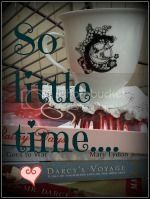 You will love the Darcy in this book. He is quite the romantic! The giveaway will end at 11:59 P.M. on the 29th of January. Be sure I can reach you should you be the winner. Good luck to all! Okay! I'm ready to read this one! Thanks for the excerpts and Happy New Year and best wishes with your new book! I hope you get to read it soon, Jen. Thanks for stopping by, Sharon. Good luck! As Elizabeth was besotted with Wickham for a short while (I presume so in this variation as well) pretending shouldn't be too difficult. Knowing his true character would make it much harder to pretend, especially when Darcy is watching! It is an interesting premise. Thanks for stopping by, Pam. Good luck. I can easily see Wickham as a spy. It's even easier to see him as a double agent, and he would certainly give up any intel on other spies if he were ever compromised. Oh, but he'd be very smug as a spy, wouldn't he! I think you pegged it, Ginna! Good luck in the giveaway! That was pretty heart-wrenching for him, and for Elizabeth too. Good luck! Lovely excerpt! My appetite is already whetted but each new post increases the determination to read it. I love Elizabeth's regretful musings and the power Darcy's declaration has over her! I hope you get to read it soon, Agnes. I love those things, too. It would be hard for that declaration to not be played over and over in one's mind...the good parts of it! :) Wow! Well, this is certainly different. I don't think Wickham would intentionally become a spy. He thinks too much of himself to risk his life. He might stumble into becoming one. He could be coerced into revealing secrets... I mean, how much could he know? He could give troupe movements, number of camps and mundane things. With the silly wife of the Colonel, he could get information from her in regard to what her husband was doing. Oh, dear, this is just getting worse and worse. Yep, he would be perfect in information gathering. Such a persuasive guy. Dang!! I can't wait to read this. Congratulations on the launch and I am so glad Lizzy isn't engaged to Wickham... shudder. I'm thankful that you decide to drop the part where Elizabeth is engaged to the villain Wickham, Victoria. It would certainly difficult for her to decide to end the engagement without blemishing her reputation. I think if Wickham is a spy for the Frenchies, it's because of money. He's a gambler so he's hard up on cash whenever he loses so that's how he was involved in spying. Whoever gives him a handsome sum, he will do the dirty work for them. You know Wickham pretty well, Sylvia! He always wants more money for his "lifestyle!" He thinks way too highly of himself!